But when everyone agrees, you can afford to be a little sceptical. Because food is about much more than just calories and nutrients. Food is also part of a wider cycle of products and services that we consume – and they also play a part in this story. People point at reports from public bodies like the UN FAO, who claim that the world loses or wastes nearly a third of the food produced for human consumption. Estimates like this include things like crops that are not harvested, perhaps because of a supply glut. Difficulties with storage and transport also mean that a large proportion of global food “waste” occurs in Africa, where post-harvest losses of food grains are estimated at 25% of the total harvested production while fruit and vegetable losses can reach 50%. European farmers may find it costs more money to harvest the produce than the crop will make if sold on a saturated market. A detailed study in Italy, in 2009, for example, claimed that the nominal value of cereals, vegetables and even “luxury” fruit and vegetables left to rot in the field was €3.5-billion. Similarly, in the UK, a 2013 report estimated that 30% of veg never make it to the table. And speaking of food not being harvested, the EU’s policy of guaranteeing farmers certain prices whether there was a market for the crops or not resulted in the overproduction of food for years that produced things like “wine lakes” and mountains of fruits and vegetables – all of which had to be destroyed at additional cost. But today, in many countries, the focus in discussion of “food waste” is always at the end of the supply chain – the supermarket shelf. France led the way with a law that actually requires supermarkets to hand over food they are thinking of binning to charities for redistribution to people on low incomes. A staggering 1.85m people benefit from the 200m or so meals it produces annually. Meanwhile, in Denmark, a network of alternative supermarkets selling surplus produce that would otherwise be wasted has been created. And in the UK, food waste campaigners from the Real Junk Food Project have opened a warehouse store in which customers are invited to shop for food thrown out by supermarkets and other businesses. The charity, which claims to have saved over a million kilograms of food from being wasted, sells it on a “pay as you feel” basis and says it has filled around 50,000 hungry bellies. Food stores and restaurants are easy targets for campaigners, but the fact is that in countries like France and Britain, it is estimated that only 11% of food waste is from retail. The reality remains that in terms of volume, the real issues lie elsewhere. As a matter of practical policy, efforts to reduce this 11% of food waste are misguided. The FAO itself admits that throwing away food is often cheaper for end users than using or reusing. When supermarkets, as in France, are either obliged to collect and redistribute food that is near its “sell by date”, or to resell it within the shop at a reduced price, the result is additional costs to the business, which will be passed on to consumers, who include people on low incomes. Supermarkets that sell off milk at half-price to “recover” their initial investment, must reduce their sales of milk at full price because the cheap purchase displaces the full-price one. This likely does not make economic sense, given that – as farmers complain – milk is supplied to supermarkets at less than the cost of bottled water. The same thinking means a French boulangerie will not sell its famous baguettes off cheap at the end of the day, because it makes more sense for them to maintain their profit margin than to “recoup” their investment in the original loaf. Which brings me to the case of water, our most indispensable nutrient. I was involved in a successful campaign in the 1990s to hold the Yorkshire Water company to account for its failure to maintain supplies to cities such as Leeds and Bradford during a rare regional downturn in summer rainfall. The feeling was that the company had put profit before responsibility by allowing more than one third of water to leak away uselessly from its pipes. 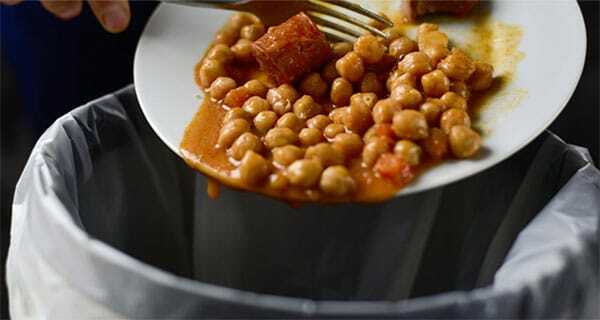 The figures for leakage – like the figures for food waste today – appalled frugal consumers. Questions were asked in the Houses of Parliament and the head of the company eventually resigned. Despite all this, it’s true that it actually makes more sense, and costs a lot less money, to pump extra water through a leaky distribution system than to lovingly tend that system. Water in the UK is cheap to collect (you just have to create and connect reservoirs) while the distribution grid is expensive to maintain. When the government imposes water meters, for example, saying it will reduce “waste”, it simply prices up water and that affects the poorest consumers most of all. A very similar story is true for food waste. When the European Union looked at the economic impact of reducing food waste it found that (paradoxically) the costs of being frugal were enormous. It estimated that in Germany, job losses resulting from reducing food production would amount to around 600,000 — and a similar hit for the two economies of Spain and Poland put together. As everyone of us who has hesitated to leave food on our plate knows, despite being full up, there is, after all, no simple link between what we eat and what we need. So next time you see supermarkets throwing away slightly off fruit, you can be a little bit more tolerant – in a sense, they are also creating jobs: jobs on farms, jobs in retail and jobs in the wider economy too. The Conversation, authored by Martin Cohen, Visiting Research Fellow in Philosophy, University of Hertfordshire.